Those of you who read My Family and Other Knitters - pt 1 will know that I come from a very creative bunch. Since my sister has been studying the family tree, we have discovered another little sprig of needlecrafting ability. As all of my maternal grandfather's family were seafarers, I always imagined that their wives and sisters spent their time faithfully knitting ganseys. My maternal grandmother's family, however, tended towards brickmaking, and it was with great please that I discovered my great-great-great-aunt Rosanna, born in 1838, who appears on the 1851 Census as a lacemaker. She would only have been 13, and was already earning money, which seems strange to us these days, but was the norm back then. However, she is the only one in the family, so I would love to know where she learnt her skills and what kind of lace she made. She lived near Salisbury in Wiltshire, so she was nowhere near the great lacemaking areas like Honiton or Notingham. The present is also quite interesting this week. 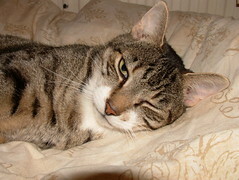 Poor little Tigger has had a trip to the V-E-T because he has a cold. He's determined to punish us for this; both Richard for taking him, and me for letting him. It has to be said, that he is punishing me far more! I've been in contact with Deborah at Simply Knitting, and I am please to say that my plus size patterns are now underway. The next thing I am having published is in issue 23, not a plus size pattern in the strictest sense although scarves do tent to be one-size-fits-all. Also, Simply Knitting now has a blog, which is well worth a read. Tigger says, "Try getting me in that carrying box again, and it will be the worse for you..."
your family history is fascinating. Thanks for sharing. and congats on the Simply Knitting patterns! great news about the Plus size patterns - about time the magazines realised how many of us need them - and how much yarn we need to use! !